A first-order RL parallel circuit has one resistor (or network of resistors) and a single inductor. First-order circuits can be analyzed using first-order differential equations. By analyzing a first-order circuit, you can understand its timing and delays. 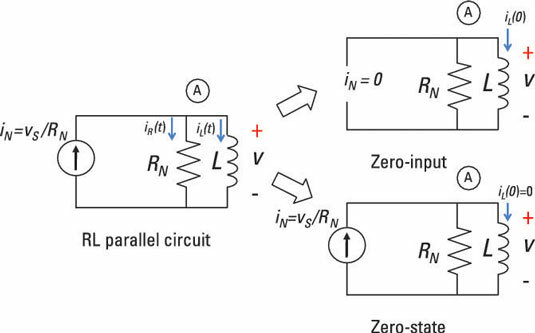 To find the total response of an RL parallel circuit such as the one shown here, you need to find the zero-input response and the zero-state response and then add them together. Now you are ready to calculate the zero-state response for the circuit. Zero-state response means zero initial conditions. For the zero-state circuit shown earlier, zero initial conditions means looking at the circuit with zero inductor current at t < 0. You need to find the homogeneous and particular solutions to get the zero-state response. Next, you have zero initial conditions and an input current of iN(t) = u(t), where u(t) is a unit step input. This solution is the general solution for the zero input. You find the constant c1 after finding the particular solution and applying the initial condition of no inductor current. After time t = 0, a unit step input describes the transient inductor current. The inductor current for this step input is called the step response. The particular solution ip(t) is the solution for the differential equation when the input is a unit step u(t) = 1 after t = 0. Because u(t) = 1 (a constant) after time t = 0, assume a particular solution ip(t) is a constant IA. The particular solution eventually follows the form of the input because the zero-input (or free response) diminishes to 0 over time. You can generalize the result when the input step has strength IA or IAu(t).